In the world of sports, the month of March always delivers. Whether it's college basketball, the NBA and NHL playoff chases, spring training, Champions League, or whatever else floats your boat, there is no shortage of excitement in the third month of the year. For football fans, March marks more than just the beginning of the new league year, but the start of the most exciting two months of the earliest phases of offseason activity. Free agency and the buildup to the NFL Draft bring all kinds of attention-grabbing storylines to the forefront of sports news outlets that cover the game, and this year's football-related March madness is approaching 'Mayhem' levels just two days into the free agency period. Things got off to a bang on Tuesday, the first official day of free agency in the NFL. Whether it was a blockbuster trade, a free agent on the move, a surprising cut, or something related to Chip Kelly's pursuit to assemble an Eagles team comprised solely of Oregon Ducks, Tuesday left nothing to be desired in terms of action. - New Orleans traded TE Jimmy Graham and a draft pick to Seattle in exchange for Pro Bowl C Max Unger and 2015 a first-round draft choice. - Detroit acquires NT Haloti Ngata and a seventh-round pick from Baltimore in exchange for fourth and fifth-round picks. Jimmy Graham has been traded to the Seahawks. -Philadelphia and St. Louis swapped quarterbacks, with Nick Foles, a 2015 fourth-round pick and a 2016 second-round pick heading to the Rams and Sam Bradford and a 2015 fifth-round pick. - While not quite as significant a move as the aforementioned three transactions, Houston has agreed to send QB Ryan Fitzpatrick to the New York Jets in exchange for a late round draft choice. The Amish Rifle will be reunited with former Bills' head coach Chan Gailey, who oversaw some of Fitzpatrick's best seasons as a starter in Buffalo. - CB Darrelle Revis is back in Green with the New York Jets, returning to the team that drafted him on a 5-year $70 million deal after a brief two-year hiatus which included stops in Tampa Bay and New England. - TE Julius Thomas leaves Denver for Jacksonville, inking a 5-year $46 million deal with the Jaguars. - The Jags also scooped up former Dolphins DL Jared Odrick on a 5-year $42.5 million contract, which includes $22 million guaranteed. - The big-spending Jaguars weren't done, adding former Cowboys Ol Jermey Parnell on a 5-year $32 million contract. -RB Ryan Mathews is heading for Philadelphia, and has agreed to a 3-year $11.5 million deal after spending the first 5 seasons of his career in San Diego. -Ndamukong Suh, this year's prized defensive asset, has signed with the Dolphins. Suh has agreed to a whopping 6-year $114 million pact with Miami, which includes $58 million guaranteed. The Lions considered matching the Dolphins' offer, though Suh was suspected to want to move on from Detroit. - TE Owen Daniels reunites with former Texans' coach and Ravens' playcaller Gary Kubiak in Denver, signing a 3-year $12 million agreement with the Broncos. Daniels still has some juice left, and there who better to extract it than Peyton Manning in an offense the ex-Wisconsin standout is intimately familiar with. - Manning may have gained a skill weapon, but loses out on one of his protectors as Orlando Franklin leaves Denver for Arizona on San Diego on a 5-year deal worth approximately $36 million. - Frank Gore may have had 'cold feet' about heading to Philly, but his tootsies appear to feel much warmer in Indy, as the veteran running back agreed to a 3-year $12 million deal with the Colts. 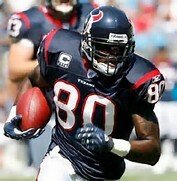 - Andre Johnson will face off against his former club, the Texans, at least twice a year after inking a 3-year $21 million deal with the Colts where he joins former Miami teammate, Gore. - QB Brian Hoyer kept up the theme of players rekindling bromances with former coaches, joining ex-Patriots O.C. Bill O'Brien's Houston Texans on a 2-year $10.5 million contract. The two worked together in New England. $4.75 million of Hoyer's deal is guaranteed, and he will compete with re-signed Ryan Mallett and rising sophomore Tom Savage for the starting job in camp. - After being cut loose by the Saints on Tuesday morning, it did not take LB Curtis lofton long to find a new home, as he signed a 3-year deal with the Oakland Raiders. Andre Johnson now finds himself on the other end of the texans-Colts rivalry. - A.J. Hawk also found a new home rather quickly, agreeing to terms with the Cincinnati Bengals on Tuesday. Hawk will return to his native Ohio, where he starred for Ohio State en-route to becoming the Pack's 2006 first-round selection. - WR Jeremy Maclin reunited with Andy Reid in Kansas City, leaving Philadelphia and putting pen-to-paper on a 5-year $55 million contract which includes $22.5 million guaranteed. -Mike Iupati continued the Bay Area exodus, leaving the 49ers for a 5-year $40 million deal with the Cardinals. - LB Brooks Reed has left Houston and agreed to a 5-year $22 million pact with the Atlanta Falcons. - Bruce Carter exits Valley Ranch, leaving the Cowboys for the Buccaneers on a 4-year contract worth $20 million. - S Da'Norris Searcy leaves the Bills for the Titans, signing a 4-year $24 million contract with Tennessee. - CB Buster Skrine swaps Cleveland for the Jets, signing a 4-year $25 million deal with Gang Green. - RB Roy Helu leaves Washington to join the Raiders on a 2-year deal worth about $4 million. 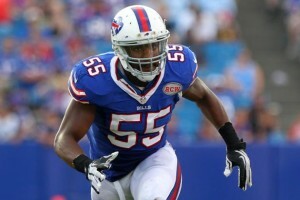 Jerry Hughes is staying in Buffalo. - WR Torrey Smith heads west, leaving Baltimore for San Francisco on a 5-year deal worth close to $40 million. - RB Shane Vereen heads for the Blue side of New York, departing New England and signing a 3-year $12.35 million deal with the Giants. - LB Sean Weatherspoon has signed a 1-year deal with the Arizona Cardinals. - DL Pernell McPhee swaps Baltimore for Chicago on a 5-year $40 million deal with the Bears. - DL Stephen Paea joins the Redskins on a 4-year deal worth about $5 million. - CB Cary Williams leaves one flock of birds for another, swapping the Eagles for the Seahawks on a 3-year $18 million deal. - CB Byron Maxwell with the heads in the opposite direction, joining the Eagles on a 6-year $63 million contract. 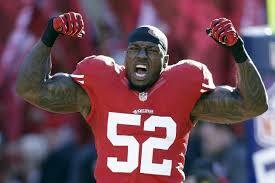 Patrick Willis announced his retirement on Tuesday. Running backs DeMarco Murray (Cowboys), C.J Spiller (Bills) and Steven Jackson (Falcons). WRs Michael Crabtree (49ers) and Percy Harvin (Jets). Tight ends Jermaine Gresham (Bengals), Jordan Cameron (Browns) and Anthony Fasano (Chiefs). OL Joseph Barksdale (Rams) and Stefen Wisniewski (Raiders). DL Terrance Knighton (Broncos), Nick Fairley (Lions) and B.J. Raji (Packers). LB Brian Orakpo (Redskins) and Rolando McClain (Cowboys). DBs Antonio Cromartie (Cardinals), Tramon Williams (Packers), Brandon Browner (Patriots), Antrel Rolle (Giants) and Brandon Meriweather (Redskins). Be sure to check back with Fantasy Knuckleheads for all the leatest free agency tidbits as there are plenty more moves to come.